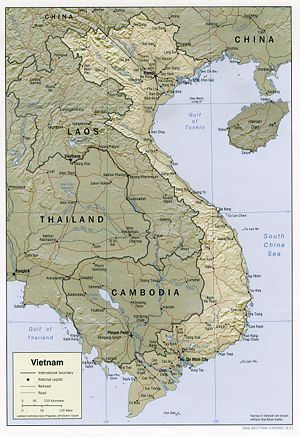 Vietnam is a country in Southeast Asia, neighboring China, Laos, and Cambodia, and with seacoast on the Gulf of Thailand, Gulf of Tonkin, and South China Sea. Now the unified Socialist Republic of Vietnam, it spawned from ancient kingdoms, was a French colony called Indochina between 1858 and 1954, and was partitioned into the Democratic Republic of Vietnam (North Vietnam) and Republic of Vietnam (South Vietnam) between 1954 and 1975. See Wars of Vietnam for significant history between 1858 and 1975, although Vietnam has known war for at least two millennia; the Vietnam War covers the period between 1957 and 1975. See Dai Viet and Nguyen Dynasty for its history before the French colonization. Its capital is Hanoi, but its largest city is now called Ho Chi Minh city, formerly Saigon. In 1986, the Sixth Party Congress established doi moi market economics, under the leadership of Nguyen Van Linh, who was General Secretary until 1991. The economy grew 8.5% in 2007. Vietnam's membership in the ASEAN Free Trade Area (AFTA) and entry into force of the US-Vietnam Bilateral Trade Agreement in December 2001 have led to even more rapid changes in Vietnam's trade and economic regime. Vietnam's exports to the US increased 900% from 2001 to 2007. Vietnam joined the World Trade Organization in January 2007, and the country is active in international trade. Deep poverty, defined as a percent of the population living under $1 per day, has declined significantly and is now smaller than that of China, India, and the Philippines. Vietnam is working to create jobs to meet the challenge of a labor force that is growing by more than one-and-a-half million people every year. In an effort to stem high inflation which took off in 2007, early in 2008 Vietnamese authorities began to raise benchmark interest rates and reserve requirements. Hanoi is targeting an economic growth rate of 7.5-8% during the next four years. This page was last modified 16:22, 25 October 2012.